Every dog owner knows how important a dog collar is. Not only is it used to show that the dog has an owner, but it also allows the owner to hook on a dog leash so that he can take the dog for a walk. Of course, you can’t just buy any collar. You need to buy a quality collar so that your dog won’t bite it to pieces. This is why you need to buy the best dog collar you can find. But how to choose the best one for your dog? We’ve compiled 15 of the best products you can find in the market. Let’s check them out along with some additional information. The material isn’t very crucial when you make your buying decision; however, it will make a difference in the overall feel of the collar. The three commonly used materials for making a collar are leather, cotton, and nylon. Obviously, leather is very durable but can easily get bite marks from your dog. Nylon, on the other hand, has more flexibility and is less susceptible to bite marks. Lastly, cotton is the most comfortable but not the most durable. The material you choose will really depend on your dog’s size, behavior, and preference. A collar’s type is a more important factor as it determines its structure and design. The standard type is the most common which usually uses buckles as fasteners. It’s very secure and usually comes with a safety clip to keep the strap in place. Another type is the slip or choke chain collar. This type is made of either nylon or metal and would have a metal ring at one end. This is where you attach your dog’s leash. 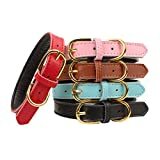 It is because of this feature that collars of this type are likewise known as dog training collars. There’s also the halters and dog harness type. Such collars are attached to the body of your dog and are considered the best dog collars for large dogs. It’s also easier for you to pull your dog back whenever he wants to run off. Moreover, it won’t choke your dog since it’s firmly strapped to his body. Size is actually an important factor because you don’t want the collar to be too tight on your dog’s neck. In order to measure whether a standard collar is a good fit, try fitting two fingers inside. If it’s too tight on your fingers, then the collar is too small. However, if it’s pretty loose and your dog seems pretty comfortable, then it’s okay. If you’re buying a choke chain or slip collar, the benchmark is a space of 2.5 to 3 inches between the neck and the collar. While the above-mentioned factors are the main ones to look at, you should also take note of other considerations. For example, you should take into account the age of your dog. If he’s still young, then you can’t use a choke chain because it might damage your dog’s throat. Another factor is the dye in the collar. Some dogs are allergic to the dye and might get skin allergies if the dye comes off. If your dog happens to have a very sensitive skin, then it’s not recommended that you buy nylon collars since nylon types lose dye the most. It is recommended to buy a leather type without any dye so that your dog won’t be exposed to that. You may also want to consider the buckle on your dog’s collar. This isn’t that important, but a collar with an easy-to-use buckle will be much easier to use when you want to slip the collar on your dog. We prefer plastic buckles since they’re quite durable, are mostly scratch-resistant, and rust-proof. They’re also usually clip-on types, so they’re pretty easy to use. This beautifully designed collar is made of nylon fabric which makes it very durable. 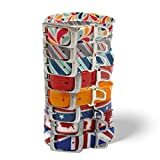 The buckle is also made to be durable as it is chrome-coated, thus making it both scratch and bite-proof. It also comes in many different colors like royal blue, florence orange, turquoise, french pink, neon green, and dark orchid. If you’re looking for perfect craftsmanship, this collar is the one you’re looking for. It is made of a naturally tanned sheepskin leather padding which makes it very soft and comfortable for your dog. It also has a solid brass buckle and D-ring to complete the whole look. It has a very beautiful color combination of brown and cream that goes with any fur color. This collar focuses on safety first and ensuring that your dog won’t run away. It is designed for strength and is especially suited for big dogs like the Dalmatian, Doberman, and Boxer. Additionally, it comes in different color combinations such as blue-red, orange-purple, lime-green, and many more. Friends Forever is a known designer of homemade patterns that are very cute and dog-friendly. If you want to give your dog a cute look, this is definitely the right collar to buy. It comes in a wide range of different designs and colors that you can choose for your dog. Additionally, it’s made of a durable material and even comes with a chrome-coated D-ring for added durability. If your dog likes to swim a lot, then the Kurgo Waterproof dog collar is perfect. Unlike most dog collars, this one is made to withstand any effects of being wet. Aside from it being resistant to getting soaked, it also doesn’t let any odor stick since the collar doesn’t absorb any type of bacteria. It’s also very durable as it’s made of a special webbing material. This collar is one of the best dog collars for walking. It has the No-Pull Headcollar feature which allows you to control your dog with just a light tug. 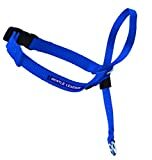 This allows you to pull your dog back from barking and running at people with just a gentle movement. It’s also really comfortable as it’s made of nylon and neoprene. 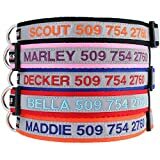 If your dog likes to run away and roam around a lot, this personalized dog collar is the perfect solution. The GoTags collar is one of the best reflective dog collars you can find in the market since it has a very bright color which anyone can see at night. It also has your dog’s name and phone number stitched on it so that anyone who finds your dog can give your house a call and return your pet to you. This is a favorite among a lot of dog owners because it allows them to see their dogs at night. Even if your dog hides in the bushes or somewhere in your front yard, you’ll be able to spot him easily from your window due to the glow in the dark LED light. It can also save your dog’s life if ever he crosses the street at night. The Mighty Paw Padded collar is like a piece of sports equipment for your dog. It was built for dogs who like to run, hike, and play frisbee with their owners. It’s made of a very tough and premium quality material that can’t be torn easily. It’s also made of a reflective material so that the collar can be seen around your dog even at night. The OneTigris collar is all about style. With its thick military design, it’s designed to make your dog look tough. Its design especially goes with the bigger and more muscular dogs like the German shepherd or Doberman. Aside from looks, it’s also very durable and comfortable at the same time with its interior cushion pad. If bow ties are your thing, then you’d probably like this collar. The great thing about it is that it’s very comfortable as it’s made of a very soft cotton fabric. 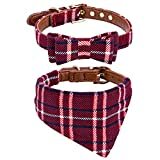 Compared to other collars made of leather or nylon, your dog might like this the most as it has a really nice feel to it. This one goes well with both cats and dogs. It’s made of a very soft polyester fabric material that’s very durable and long-lasting. It also has a really trendy look because it looks exactly like a bandana. It’s great for small dogs who like to stay outdoors most of the time. This beautiful dog collar is perfect for smaller dogs and looks exactly like a watch strap. Since it’s made of durable leather, it’s both scratch and bite-proof even if your dog has sharp teeth. It also has a nickel plated buckle and D-ring for added durability. It’s probably one of the best martingale dog collars you’ll ever find. Being a slip collar type, it allows you to control your dog without putting too much pressure on its neck. This allows you to use it for training purposes. It’s also available in a variety of colors and designs to suit your dog. This brand combines simplicity with quality. 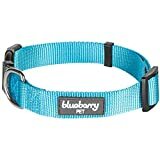 It may not look flashy like the other collars on this list, but it does give off an elegant vibe that will definitely fit any dog. It’s also very strong as it is made of tough leather. Basically, it’s functionality and style combined into one. Q: Are dog collars safe? A: While dog collars are generally safe, it will really depend on how it is used. Even the best leather dog collars aren’t safe from dog collar accidents. The way to prevent any accidents is to always choose the high-quality dog collars for your dog. Choosing the right one based on size, type, and other factors will help lessen the risks of any accidents that may occur when you take your dog outside. We recommend that you always go through the buying guide before you buy a dog collar so that you know how to choose the right one for your buddy. 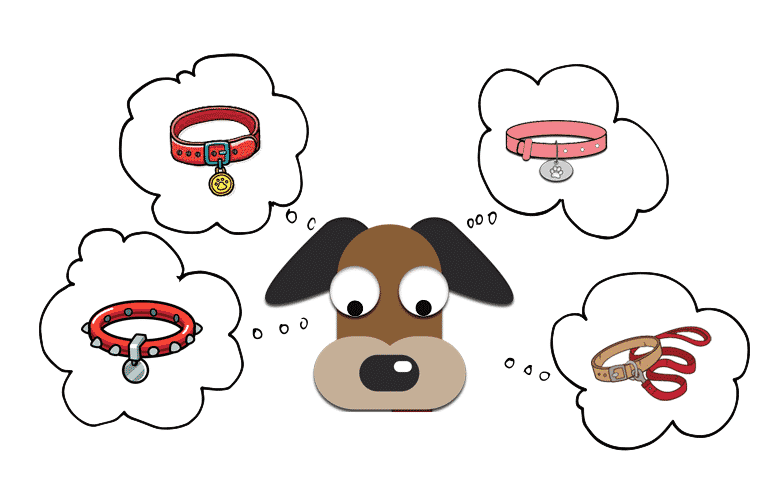 Q: How do I know what size of a dog collar to get? A: In the buying guide, we gave a rough idea on how to determine the size of the collar. If you feel like going into the specifics, we can determine the size by using the dog’s neck as a base measurement. There are several sizes you can choose from but mostly they fall into 4 groups: XS, S, M, and L.
If your dog’s neck is somewhere around 8-11 inches, an XS collar with a collar width of ¾ inches will do. If your dog’s neck is around 11-15 inches, you’d best get an S collar with a width of ¾ inches. For necks ranging from 15-22 inches, you have to get an M collar with a collar width of 1.5 inches. Lastly, necks ranging from 19-30 inches need an L size collar with 1.5 inches of collar width. Q: How tight should a dog collar be? A: As mentioned in the buying guide, you have to make sure that your two fingers perfectly fit in between the neck and the collar without choking your dog. If your dog feels uncomfortable while your two fingers are there, then it’s too tight. If you want to be totally safe, then you can also customize the size of your collar. Most pet shops are able to create collars that are an exact fit on your dog’s neck. Of course, you may have to pay a bit more, but it’s worth it anyway. The best thing is that if you customize the size, you can customize the design too. With this, you can get the best-personalized dog collars for your dog. Q: How to clean a dog collar? A: The best way to clean a dog collar is to soak it in dog shampoo so that it won’t cause allergies on your dog. First, boil some warm water and put dog shampoo into the water until bubbles form. Soak the collar in the water for around 15 minutes and then take it out. Rub it against itself a few times to take out any dirt and grime while washing it in the water again. Keep on rubbing until no more grime comes out. If the collar smells really bad, put baking soda in the water instead of soap. In the same way, rub the collar against itself until the smell goes away. This method also allows you to take out the very hard-to-remove stains and grime. Whether you’re looking for the best dog collar for walking or pulling, we can all agree that our dogs need to have the best dog collars there is for them. This is why we compiled the list of the best collars that we know of based on features and overall experience. Your dog definitely deserves the best, so you as an owner have to buy only the best.